This affordable college textbook is perfect for an introductory creative writing classroom, a multi-genre creative writing course, or for a special topics class focused on flash writing, prose poetry, or other hybrid short forms. H. K. Hummel and Stephanie Lenox introduce both traditional and innovative approaches to the short form and demonstrate how it possesses structure, logic, and coherence while simultaneously resisting expectations. ​The book includes a diverse anthology of (mostly) contemporary short-form writers. For more about the book, teaching resources, and information about exam or review copies, please visit: https://short-form.weebly.com/ or the publisher's site. Think there's nothing poetic about annoying coworkers, endless meetings, and stained coffee mugs? Think again. The Business transforms office politics and paper clips into a funny and critical examination of the mortal rat race. If you've ever been fired, let go, unemployed, underemployed, or overlooked, these poems are for you. "... the strangest, wildest, and most precise of poetry, written by a poet of extraordinary talent and skill." "...a look at office life as unflinching as Dilbert." Commune with the Leopard Man. Strut with Bernie, the world's oldest male stripper. Fly through the air with the Amazing Cannonball Couple. With humor, insight, and a deep appreciation for the beauty of the world, the voice-driven poems in Stephanie Lenox's debut collection sing a collective ode to our common strangeness. "... euphoric, generous, gracefully obsessive." "Reading her work is like watching a brilliant trapeze artist." Stephanie Lenox is the co-author of Short-Form Creative Writing: A Writer's Guide and Anthology with H.K. Hummel. 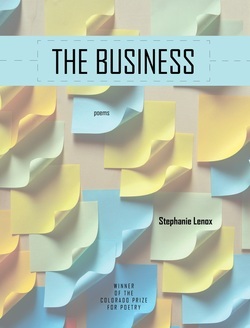 Her most recent poetry collection, The Business, was selected as the winner of the 2015 Colorado Prize in Poetry. She is the author of Congress of Strange People, and a chapbook, The Heart That Lies Outside the Body, winner of the Slapering Hol Chapbook Competition. She lives with her family in Salem, Oregon, and works as an editor at Chemeketa Press.